Dye your cowboy boots to give them a refreshed look. 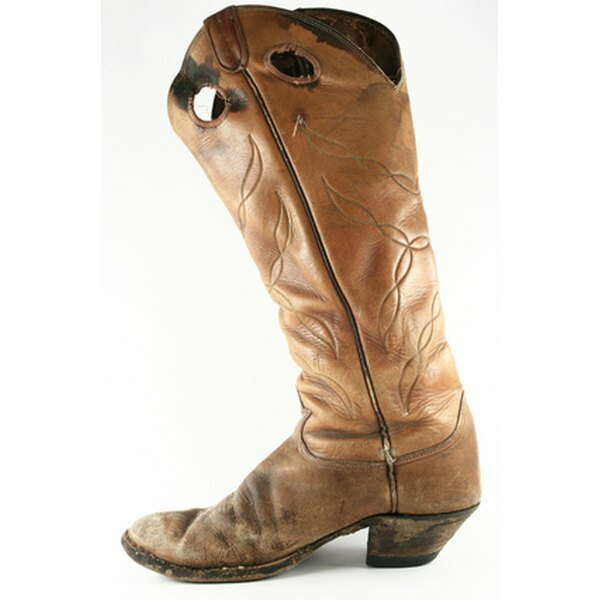 Leather cowboy boots are an investment that is well worth the cost. At some point, however, you may want to change the color of your boots. You can do this with leather dye. You can easily alter the color of leather, but you should consider the previous color. It will be more difficult to change the color of a dark leather than a light leather. Cover your work area with newspaper. Clean the boots thoroughly with methylated or white spirit. Allow the boots to dry completely. Shake the bottle of dye and then pour the necessary amount into a small container. Brush the dye onto the boots evenly. Do this with a brush that is provided with the dye or a small, clean brush. Allow the dye to dry. If the coat is uneven, apply a second coat to the boots in the same manner. When the dye is dry, you can polish your boots with shoe polish of the same color. Use a dye that is specialized for leather only. If your boots are suede, a different kind of dye will need to be used that is specific to suede. Be aware that the color of your boots to begin with may alter the final results. Emily VanUmmersen has always had a way with words. She has enjoyed an education filled with classes that required writing essays and stories. She enjoys writing and learning about health, green living, fashion, art and cooking. She has been a contributing writer for eHow and Pluck on Demand.